'The Moodys'. Have you watched this Australian ABCTV comedy series? I caught it a few eps into series 1 and I was instantly hooked, and watched all the eps back to back. There's Terry Moody (played by Darren Gilshenan) who I think is the absolute star of the show. He puts the 'D' in dysfunctional as the token weird family uncle. Then there is the incredibly talented Patrick Brammall as Sean Moody (Patrick's portrayal of Sean won him the 2013 AACTA award for Best Performance in a Television Comedy. It's well deserved - he is fantastic. The character who drew me into the series to start with is Ian Meadows, as Dan Moody. He is gloriously awkward and it's kinda fantastic to watch him squirm. 'The Moodys' follows on from 'A Moody Christmas', the series that followed the adventures of Dan Moody who returns home from London to spend each Christmas with his crazy family. The six part series was screened on ABC1 in the lead up to Christmas in October, November, and December 2012. Each half hour episode followed the Moody family on Christmas Day over six years. It was brilliantly written, very clever, and very funny! I could not wait to see what happened on every ep, when the family converged after a whole year, at what can be one of the most taxing times for some families. The results are hilarious! The Moodys cast also stars Jane Harber (Offspring), Danny Adcock (Jesters), Tina Bursill (Offspring), Guy Edmonds (Underbelly: Razor), Darren Gilshenan (Chandon Pictures), Rachel Gordon (Blue Heelers), and creator/writer Phil Lloyd (At Home With Julia), and introduces new cast members Sacha Horler (Offspring, Crownies), Ryan Corr (Packed to the Rafters, Not Suitable for Children), and Jonny Pasvolsky (Home and Away, Underbelly). In the new series Dan (Ian Meadows) and Cora (Jane Harber) return home to Australia to set up house together. Now they are back home and everything in their lives is topsy turvy (of course!). As they struggle to make ends meet, the Moody family home is up for sale; Sean’s (Patrick Brammall) funeral fireworks business is going great guns – quite literally; Maree (Tina Bursill) and Kevin (Danny Adcock) test the freewheeling lifestyle of the 'grey nomads'; Bridget (Rachel Gordon) and Roger (Phil Lloyd) find out if there’s friendship after divorce; and Uncle Terry (Darren Gilshenan) is in a tangled love affair with Yvonne (Sacha Horler), a one-woman whirlwind. This relationship is a perverse pleasure to watch! 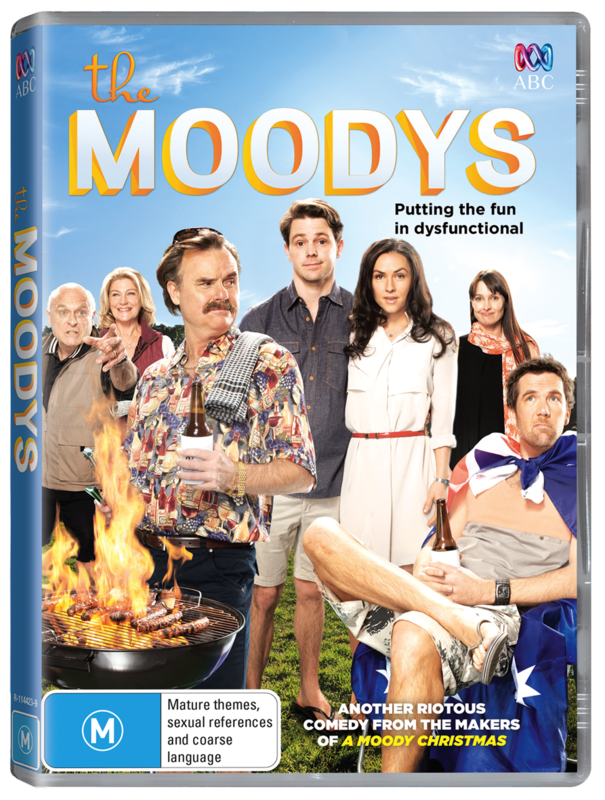 The Moodys is created and written by Jungleboys’ Trent O’Donnell and Phil Lloyd, the multi AFI Award-winning team behind the critically acclaimed comedy series Review with Myles Barlow, and directed by Trent O’Donnell and Scott Pickett, also from the Jungleboys team. *Competition is open for one month and to Australian residents only.